Now, just a month after the beginning of treatment, Sarah is improving. As might be expected, the most recent deficits are being reversed first. Her speech is no longer slurred, but is clear. She is able to stand unaided. The cognitive defects have largely gone. She no longer experiences L’hermitte’s phenomenon. Of course, there is a long way to go, but this is a beginning. It is often said that MS is a remitting disease, but once the the progressive phase is established it is generally considered to be relentless: global improvement is rare. Walking is a little more disorganized. Recovery is not just a case of the simple return of function. Repair takes place at a cellular level, and is not centrally organised. As repair takes place there are any number of strange sensations – Sarah says they are quite indescribable – which, until they become organised, actually hamper function. Function has to be relearnt. She makes the point that ‘it is easier to walk on numb legs than on legs where unordered sensation is returning.’ There are motor counterparts to this – twitching of fingers and minor involuntary movements of limbs – but these are minor. Sarah has noticed that these events herald a big improvement in function. Recovery takes place in a step-wise manner, as function is re-learned. A great improvement in walking (with the help of a trekking pole, and rests). Just over three months after beginning doxycycline and roxithromycin, and after 12 injections of Vitamin B12, and oral supplements, Sarah felt well enough to begin a short course (5 days) of oral metronidazole, 400mg three times a day. This is the main bacteria-killing antibiotic in this regime. A reaction to the release of bacterial fragments is to be expected, and it certainly occurred. It began about the third day, and presented with unsteadiness, difficulty in thinking, and feelings of unreality: it continued for three days after metronidazole was withdrawn, and then gradually tailed off without a definite end-point. Prochlorperazine, 10mg orally, was highly effective in dispersing the symptoms of this reaction. A high fluid intake, maintenance of blood sugar levels by drinking plenty of glucose dissolved in water or fruit juice, and activated charcoal capsules last thing at night were all helpful. If activated charcoal is used, it is best taken with water only on an empty stomach, remote in time from food and from drug and vitamin dosages. Ignore any manufacturer’s instructions which recommend taking after food. 6 – 8 260mg capsules seem reasonable. It is harmless. Unlike the first reaction (on beginning doxycycline) there was no transient loss of neurological function; indeed, good progress continued over the five days of metronidazole treatment. For the first time in nearly 18 months Sarah was able to ride a bicycle, though she says that she is not ready to cycle regularly because of the risk of a fall. Falls are a real danger in anyone with MS.
A second course of metronidazole was started; in retrospect it was begun too soon. The reaction from the first course had not quite faded, and the reaction from the second was thus cumulative and very brisk. The second course was given for three days only. The reaction was accompanied by unsteadiness, slight numbness in the feet and tingling in the hands and feet. Four days later this was largely gone. While painting, Sarah notices that she is able to use her right hand for longer, and that the necessary rest periods are shorter. Her work is gaining assurance. The toxic reaction continues, coming and going in an irregular manner, suggesting that the second course of metronidazole had in some way disclosed the intracellular components of the organism to the immune system. Her urine was found to contain abnormally elevated levels of porphobilinogen, and this while she was on an antiporphyria regimen (high fluid input, high carbohydrate diet, avoidance of red meat and alcohol, activated charcoal twice a day;) this is evidence that the reaction has at least some elements of a secondary porphyria. The toxic reaction is unpleasant but not intolerable. It shows that germs are being destroyed. It manifests itself as slight numbness in the feet, tingling of feet and hands, and an unsteadiness described as ‘being on the deck of a ship’. I have seen an identical toxic reaction in others (non-MS sufferers) when heavy chronic infections due to Chl. pneumoniae have been treated with cidal antibiotic combinations. While unpleasant, it confirms an infection. Underneath the symptoms of this reaction, the CNS improvement continues. The signs of spasticity and clonus, so typical of MS, have nearly gone. The abnormal plantar reflexes (evidence of damage to long central nerve tracts) are now nearly normal on the left and are less intense on the right. Sarah is able to use her right hand more forcefully and for longer periods. She can handle heavier objects. Her handwriting has improved. A second MRI brain scan, 26 weeks after the first, showed great improvement. Not a single new lesion was seen in the white matter of the brain, and most of the lesions seen on the first scan were smaller, had lost their distinct outline and were less dense (allowing for the different densities of the two films.) The larger (and presumably later) lesions towards the periphery of the white matter were particularly diminished. There was not much change in a group of small periventricular lesions; these were presumably early lesions which had undergone gliosis (scarring); much change in these would not be expected. The consultant radiologist, who examined the two scans within minutes of the second one being taken, was delighted. Otherwise, the porphyric reactions continue. I have seen these in a number of patients now; the symptoms typically come and go through the day. They are characterised by symmetrical but incomplete numbness and tingling in the extremities; slight weakness of the hands and feet; vestibular disturbance (vertigo on moving the head but not while the head is kept stationary) and a rushing sound in the ears, often with a low-frequency component. Although they sound alarming they are not really troublesome. The numbness is more apparent than real; the sense of touch is hardly impaired. It is important to emphasize that these symptoms represent non-central neuropathy, and thus have nothing to do with MS. They may also be experienced by patients with non-CNS active persistent infections with Chl pneumoniae even before treatment begins, and tend to worsen as the disease is treated and the organisms killed. Often there is a ‘flu-like component to these reactions. Sarah continues to make progress. The grip and dexterity of her right hand – weakness of which was the first event in her disease – are now near normal. The porphyric reactions continue, and are annoying rather than problematic. Sarah has now been treated for 13 months. In that time there has been no adverse CNS event. A third MRI scan, taken at the request of the radiologist, shows no new lesions; the old lesions are continuing to shrink. Some large lesions have vanished altogether. The radiologist said that he had never seen this before in MS and intends to discuss the films with specialist neuroradiologists. Progress is being made on both motor and sensory fronts. Hand-grip is equal on both sides; sensation is normal in both feet. Sarah still has the minor peripheral neuropathy which seems to occur when a persistent infection with Chlamydia pneumoniae is treated, and which is due, in part, to haem-precursors being systemically liberated following programmed host-cell death. (Chlamydia pneumoniae hinders programmed host-cell death in chronic disease, and when it is killed there is massive restructuring ‘housekeeping’ of host tissues.) It has a diurnal pattern, growing worse during the day but vanishing during the night. It is often seen when treating patients with a serologically proven chronic Chlamydia pneumoniae infection; its intensity seems be proportional to the original bacterial load. It can also be seen in patients with very large-load infections before treatment has begun. Chronic intracellular infection can cause an imbalance in the cellular and humoral arms of the immune system, eliciting the latter (possibly by the release of bacterial proteins) which then suppresses the former. This leads not only to the inability of the immune system to resolve the infection, but also to an inappropriate response to other foreign proteins. The same process may give rise to allergy. Treatment of the infection seems to right this imbalance. This seems to have happened with Sarah. For many years insect-bites had caused her major discomfort; cat-flea and mosquito bites would cause huge fluid-filled blisters (4 cm or more in diameter) and would make her feel unwell for several days, even weeks. Since treatment began insect-bites have ceased to be a problem. Sarah stopped the continuous antibiotics two months ago. Improvements continued after they were stopped. We have decided to give a discontinuous maintenance therapy of 14 days doxycycline 200mg daily and roxithromycin 300mg daily*. Metronidazole, 400mg three times a day, is given for the final five days. This maintenance schedule is to be repeated at two month intervals. Otherwise, Sarah is still seeing benefits – her fine control of fingers and general dexterity has increased remarkably. Delicate, intricate tasks (like putting in ear-rings with ‘butterfly’ stays) are now easy. She also has increased tenacity in repetitive tasks such as handwriting. Sustained spontaneous global remissions are very unusual in MS once the progressive phase of the disease has been established for more than a year. [Kremenchutzky M., et al. 1999 Brain Oct;122 (Pt 10):1941-50.] Sarah’s improvements would be very rare. *If roxithromycin is unavailable, azithromycin may be used. Rifampicin is not suitable for intermittent use. The intermittent therapy is going well. Sarah is painting a delicate water-colour as I am writing. Recovery continues, particularly with regard to fine control and dexterity; also stamina. 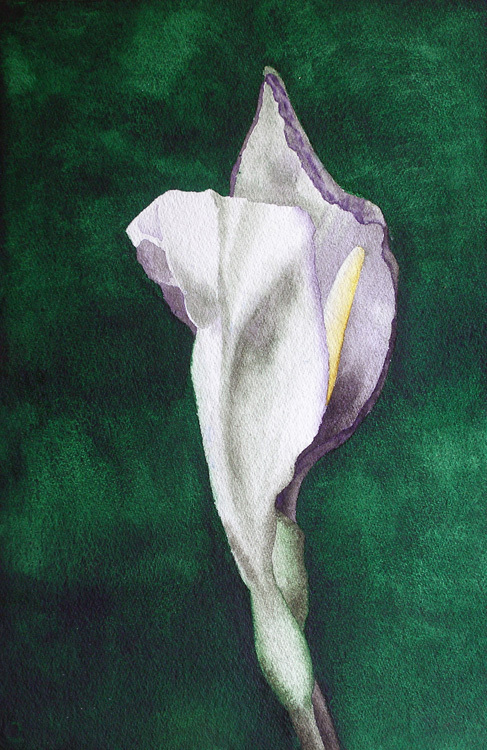 Sarah Longlands, Tulip. 2005 Watercolour 74cm by 54cmThe serial MRI scans have been reviewed by a specialist neuroradiologist, who says that he has never seen such resolution of all newer lesions in established progressive MS.
And the solution is through this link. It is now two years since Sarah first started on the antibiotics; in that time there has been immense improvement. Reviewing those two years is emotionally difficult; early improvements took place in a step-wise fashion and were quite irregular. For a time walking actually became more difficult as sensation came back. Recent improvements – which are still taking place – are more subtle and take place smoothly. During this two years Sarah has not experienced any new CNS deficit. At her lowest point Sarah was sliding down the disability (EDSS) scale very rapidly, falling through level 6 towards level 8. She has now returned to level 2 of this scale. This microorganism is known to cause chronic persistent infection throughout the body; it is also known to hamper cellular function. I suspect that much of the improvement comes from reduced oxidative intracellular damage and some degree of recovery from mitochondrial stress: this is a good reason to take a broad range of antioxidant supplements. A fourth MRI brain scan was relatively unchanged from the third, taken a year ago. There have been no new lesions since the antibiotics were begun, and there has been shrinkage of many pre-existing lesions. There’s little to say, but it’s all positive. Perhaps the best thing is the subtle completion of a return of Sarah’s facial expression. Fatigue has long gone except for the natural tiredness which follows a long day’s work. Sarah now has the stamina to paint all day, something which wouldn’t have been possible only a few months ago; benefits seem to be consolidating. Endurance is better with walking, too. Sarah has been working on something she has been wanting to do for a long time: four watercolour studies of Wild Arums which were growing under our front hedge. Here is one of them. Again, endurance and stamina have increased. 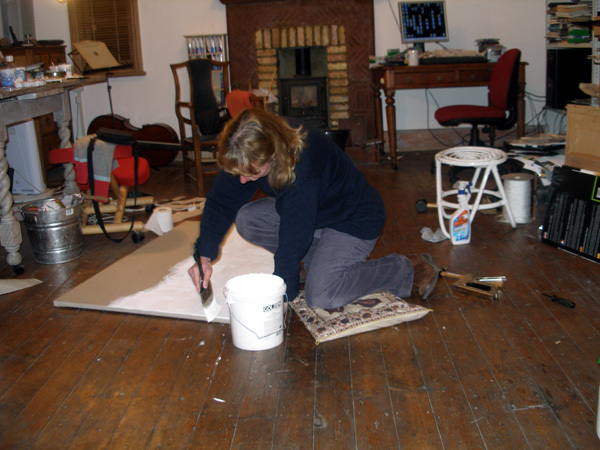 Sarah is planning some large paintings and has stretched two large canvasses. This requires considerable strength in the arms, as anyone who has done this will tell you. 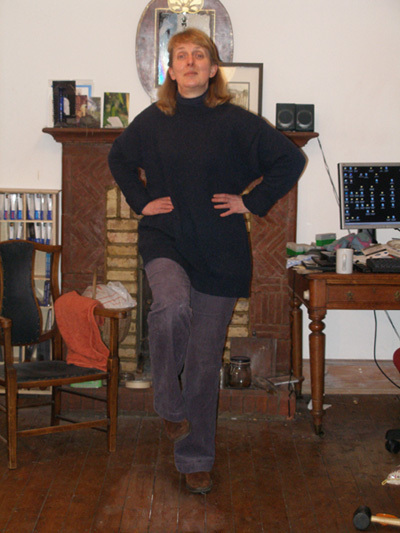 Here’s a photograph taken during a break, showing the artist standing on one leg. This would have been impossible before antibiotics were started. All continues well, with many subtle improvements. The previous update shows a canvas being primed by the artist; that and its fellow are now completed paintings. Updates are likely to be less frequent now that Sarah has regained so much her old self. It is now three years since Sarah first started treatment; in that time rapidly advancing secondary progressive MS has not only been halted but has been pushed right back. This is very rare in the natural history of the disease once progression has been in place for over a year. Subtle improvements continue. It is a clinical truism that, even in single-event occurrences, such as accidental damage or stroke, significant improvement is unlikely in deficits which have been in place for six months or longer. The fact that Sarah is still finding improvements after three years is in all likelihood due to her regimen of supplements which aims at reducing oxidative damage, promoting nerve repair with methylcobalomin, mitochondrial support and reduction of inflammation. One might envisage ongoing improvement due to the finding of alternative pathways, but this cannot account for the steady improvement in the Babinski response in the right foot. At the time of starting antibiotics one had only to touch the great toe to elicit a violent extensor response; this has steadily improved, and, though the plantar response is still mildly extensor in that the toes fan slightly, all trace of clonus is gone. This same long-term improvement is seen in Sarah’s right hand, which had been weak for a year and paralysed for six months. Strength returned gradually, but it is only in the last few months that Sarah has noticed that it has regained its former dominance in carrying out reflex actions. Again, subtle improvements are noticeable. Back in 2003 Sarah had a slight disconjugate gaze. This sign, which is very common in MS, denotes a disorder of eye movement; on laterally traversing the gaze, one eyeball follows the other and takes a little time to catch it up. This is now inapparent in Sarah, especially if you had not known about its presence previously. Improvement is not confined to the CNS. Chronic infection with Chl. pneumoniae is known to parasitize soft tissue cells and stimulate their division. This may account – unlikely as it sounds – for the increasing soft tissue and adipose bulk which may be found in middle age. I have found that, in the years following adequate treatment of chronic infections with Chl. pneumoniae, that weight, Body Mass Index and appearance may all be normalized. Sarah is undergoing this bodily ‘remodelling’. In fine, she looks more youthful. It is now almost exactly eight years since Sarah began antibiotics for aggressive secondary progressive multiple sclerosis. In that time progression has stopped and the disease largely rolled back. Nine years ago this month the Consultant Neurologist to whom Sarah was referred, after a history and a thorough examination, took me to one side and told me to prepare for the worst. The disease, multiple sclerosis, was in a progressive mode and behaving very aggressively. He advised me to look round for a nursing home. Her career as a fine artist was over. He was very frank, and I respect this. 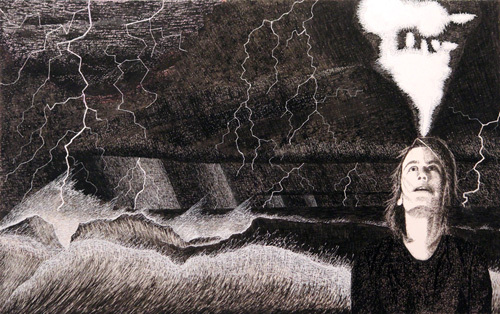 Nine years on, Sarah is walking, painting, drawing – in fact she is doing some of her best art. From time to time she sends the above Neurologist a print of her latest work. She has never received any communication in return. Now, were I a clinician with a duty of care to a person given a disastrous diagnosis who learned that the disaster had been turned around, I should be curious to know why. It seems that not all doctors have this approach. Some evidently put their professional gravitas above their interest in patients as persons. It is painful to say this, but it is true. Last month marked the tenth anniversary of Sarah’s diagnosis of secondary progressive MS and her beginning treatment for a chronic infection with C. pneumoniae. In these ten years there have been no new manifestations of the disease, and plenty of recovery. Sarah is now painting and drawing; she has been working on a series on the subject of Ariel to accompany a poetry sequence of mine. We are fond of this close collaboration. Ten years! What a ten years! Ten years ago Sarah received a dire diagnosis. How to review this last decade? Firstly, with gratitude to Charles Stratton and his colleagues. Secondly, gratitude to Sarah herself for her courage and tenacity. Thirdly, gratitude to those few good friends and family who have stayed with us and supported us. Thank you, Charles Stratton and the Vanderbilt doctors for making your work available in the public domain; thank you, Lorane Fitch and Rob Oakley for bringing the MRI forward (Sarah was deteriorating so fast that I think a few more months waiting would have seen the end.) And thank you, the friends who supported us in our time of need. NoteOver the course of the last ten years I have received a number of emails from persons who, having read these pages, assert that Sarah never had multiple sclerosis. These persons inform me that she had Acute Disseminated Encephalomyelitis (ADEM). Some of these amateur neuroscientists (who have never spoken to, taken a history from, or examined the lady) have been quite strident in their assertions. Well, Sarah’s illness was completely typical of Relapsing-Remitting MS developing into Secondary Progressive disease. Sarah experienced seven relapsing-remitting episodes involving different parts of the CNS over two decades; remissions became partial; then her illness began to slide into the secondary progressive form over two years. This is not seen in ADEM, where the picture is of acute post-infective encephalitis. Although ADEM is seen in adults, it is more often seen in children, peaking between 3 and 10 years. ADEM is rare (7 per 1,000,000); MS is common (1.2 per 1,000). MRI imaging shows different appearances; lesions in ADEM have poorly defined margins; those of MS are more sharply defined. The spatial arrangement and the shape of lesions in the two diseases is different. Sarah’s MRI showed lesions typical of MS. So, it is certain that Sarah had Secondary Progressive MS, a diagnosis made by a consultant neurologist. She (and others) recovered because she was treated rationally using evidence-based medicine. And by evidence-based I mean evidence-based.